December 17, 2013, marks three years to the day since Tunisian street vendor Mohamed Bouazizi set himself on fire in protest of the rampant corruption within the regime of then-president Zine El Abdine Ben Ali. His inability to pander to the patrimonial system by bribing officials in the city of Sidi Bouzid had left him unable to operate his fruit cart, his only source of livelihood. This brazen act of self-immolation helped to spark Tunisia’s Jasmine Revolution and, in effect, the subsequent revolutions in Egypt, Libya, Bahrain, and Syria – known colloquially as the Arab Spring. 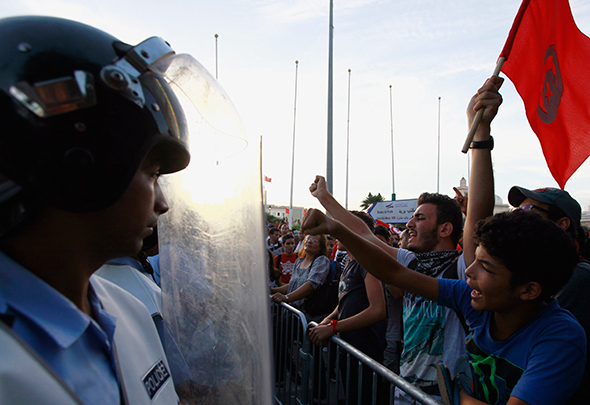 Aside from corruption, the protest movement in Tunisia also sought to address many of the citizens’ grievances with the country’s authoritarian regime, which had been in power since 1987. These included issues such as high unemployment rates, high levels of societal inequality, poor living conditions and a lack of freedom of expression and other political freedoms. This latter point regarding freedom of expression constituted an especially grievous concern. As noted by a 2005 report released by IFEX’s Tunisian Monitoring Group, freedom of expression was virtually non-existent in the country under the Ben Ali regime. The government attempted to control information flow wherever possible, and these efforts spanned multiple platforms. Before going to print, periodicals and books had to be vetted by the Ministry of Interior, while Internet blockers denied Tunisians access to local and international political opposition websites and alternative news sources. Mainstream newspapers failed to publish any criticisms of the government, while activist groups such as the Tunisian League of Human Rights had their meetings cancelled under “worrying circumstances,” denoting a restriction on freedom of assembly. The deposition of President Ben Ali in January, 2011, ushered in hope for a significant improvement to the climate for freedom of expression in Tunisia. Unfortunately however, the realities of the post-revolutionary situation in the country have failed to actualize this potential. Despite holding democratic elections to install a new leadership and Constituent Assembly on October 23, 2011, the new Tunisian constitution that was promised remains elusive. Free expression has been a major sticking point in the hypothetical document, made clear in alerts issued by groups including Reporters Without Borders (RSF) and the Civil Coalition for the Defence of the Freedom of Expression, the latter of which CJFE is a signatory. According to a report issued by RSF, the latest iteration of the document, released on June 1, 2013, remains problematic in its treatment of freedom of expression. For example, though Article 30 of the draft constitution states that, “freedom of opinion, thought, expression, media and publication are guaranteed,” it does not specify that this freedom is guaranteed for all members of society equally. It also fails to make provisions for freedom of Internet communications, protection of sources, and the independence of the media. Such apparent loopholes render it a version of the constitution that is improved, but which remains problematic, as it contains provisions for these rights without any means to guarantee them. Aside from the theoretical threat presented to free expression by the potential constitutional oversights presented above, the right to freedom of expression is also being compromised in very real ways in Tunisian society. As Human Rights Watch reports, activists and journalists in the country continue to be arrested on charges such as “defaming public officials,” evidently posing a threat to freedom of expression and opinion. On September 9, 2013, union leader Walid Zarrouk was sentenced to detention for writing a Facebook post criticizing the politicization of prosecutions, while journalists Zouhaer al-Jiss and Zied el-Heni were similarly summoned by prosecutors that same day. Al-Jiss was indicted for moderating a radio program that hosted a guest who criticized the president of Tunisia, while El-Heni was detained for criticizing the arrest of a cameraman who had filmed an egg-throwing attack on the country’s culture minister. The challenges to free expression don’t stop with journalism. As Al-Monitor reports, artistic freedoms are also being violated. Tunisian rapper Weld el 15 was sentenced to two years in prison without parole on June 13, 2013, after releasing a song titled “The Police Are Dogs,” and 20-year-old artists Ghazi Beji and Jabeur Mejri were each sentenced to seven and a half years in prison for making cartoons offending the Prophet. These examples demonstrate that substantive freedom of expression is still a long way off in post-revolutionary Tunisia. It is not enough for the government to address these rights nominally without offering a credible commitment to its citizens that they will be protected. As long as the right remains institutionally unprotected through the ambiguities of the constitution, authorities will continue to have the potential to overturn these rights if and when it suits them. It is imperative that the Tunisian government recognize the need for true mechanisms to defend and protect these rights, and amend the proposed constitution accordingly, in order to truly protect the right to free expression and all human rights in Tunisia. After all, a spoken commitment to a cause is worth little without actions that fortify it.